Release Info: Robert Pollard�s new solo album Mouseman Cloud shows the Guided By Voices frontman in a playful and spontaneous mood. This is a record by a guy who just wants to rock, and not have to worry about how that rock will be received by anyone other than himself. While the songs here are not a world away from anything you�ll find on GBV�s new Let�s Go Eat the Factory album, the emphasis on Mouseman Cloud is on wordplay rather than melody, on unkempt exploration rather than traditional song structure. 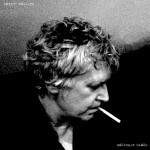 A lot of the tracks sound as if they started as lyrics�even poetry�and were fit around the sounds, which is not an uncommon way for Pollard to work, but the album�s gleeful verbosity could be interpreted as the work of a man who might have been feeling the pressure of expectations from (for instance) a Guided By Voices reunion and just wants to cut loose. Recorded in collaboration with producer / multi-instrumentalist Todd Tobias, Mouseman Cloud is catchy, heavy, lovely, rocky, exuberant, complexly simple and freaking wonderful. Not sweating the small stuff is not the same as taking no pains over the writing and recording�too often the two are conflated when discussing Pollard�s prodigious output. He takes pains. He edits. He cares deeply about each and every part of each and every song he records. That he seems to do so frequently and effortlessly is not his fault. It�s a unique and unparalleled talent. Mouseman Cloud is the work of a consummate craftsman as well as a crazy genius, and proof that these two traits are not incompatible. Original release date was to be 3/20/2012, but release was pushed back due to the success of Let's Go Eat The Factory.